Motorola is on a mission. For the last two years, it's been trying to suss out the finest blend of silicon and style it could get away with selling for just $180. And for the last two years the company has had winners on its hands -- can you say "best-selling smartphone in Motorola history"? That level of success makes crafting a second Moto G sequel even trickier: Can Motorola keep its winning streak alive? Have people come to expect more out of a cheap phone than what the company can provide? It's true that this year's model doesn't stray far from the formula we've already seen, but make no mistake: The 2015 edition is still the best deal you'll find on a good Android phone. 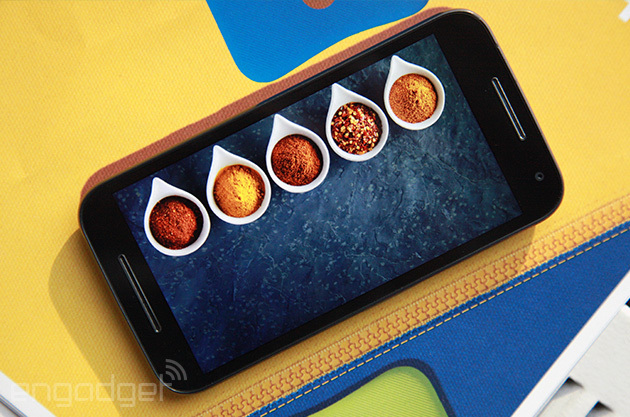 How would you rate the Moto G 3rd-gen? 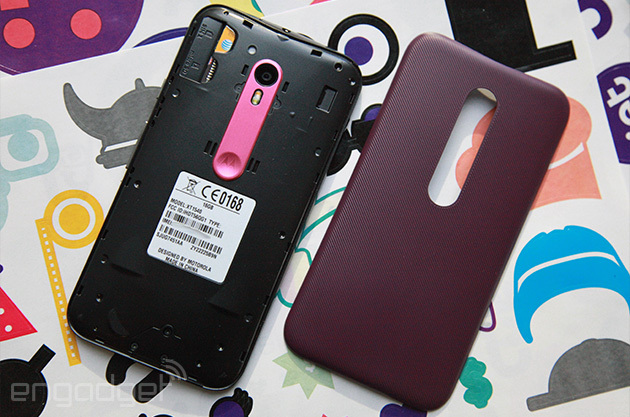 There wasn't much broken about the Moto G's design, so Motorola didn't bother fixing much. We're still looking at the same curves, and the same chrome accents that actually look like dual front-facing speakers. (In fact, only the bottom one pumps out the jams.) Wedged between those grilles sits a 5-inch, 720p screen (the same size and resolution as last year), with a sheet of Gorilla Glass 3 providing some extra protection. So far, it seems to be doing the trick; I'm already seeing little pockmarks and dents in the plastic frame, but there's nary a scratch on the panel itself. Alas, the introduction of Moto Display to the G line this year means that you'll get all your notifications from fancy little onscreen icons, so the notification LED that used to be something of a Moto G hallmark is no more. The design team clearly took some cues from this year's version of the entry-level Moto E, which has optional colored bumpers that gave the phone a nice, grippy feel. 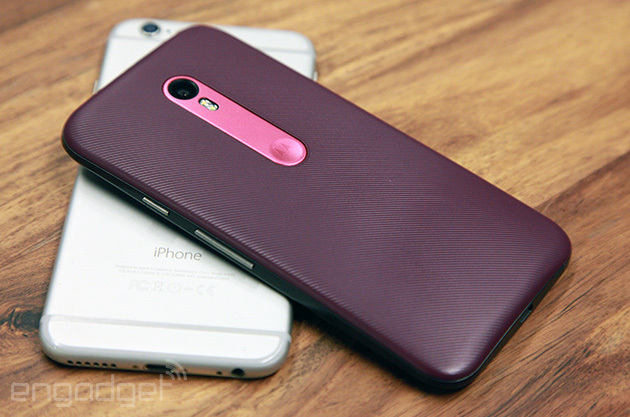 This time, though, Motorola took that textured finish and applied it to the entirety of the G's removable backplate. The sides are still as sparse as ever -- there's a textured power button and a volume rocker on the right edge -- so the phone isn't actually much easier to grasp than earlier models. C'est la vie. It's a bit of a clunker too, in that sort of streamlined, Motorola way. And while the 11.6mm waistline makes it heftier than its rivals, it's not what I'd call uncomfortable to use. Meanwhile, under that backplate lurks a locked-down 2,470mAh battery, joined by a micro-SIM tray and a microSD reader that accepts cards as large as 32GB. That last detail is crucial, since the Moto G is only available with 8GB or 16GB of built-in storage (the 16GB variant also includes 2GB of RAM, as opposed to 1GB in the base model). Beyond all that lies the quad-core Snapdragon 410 running at 1.4GHz, and while it's plenty powerful for most day-to-day stuff, I was secretly hoping Motorola would graduate to one of Qualcomm's 600-series chips this time around. Turns out, my fervent calls were answered, just for a completely different device; Motorola's Moto X Play happens to run a Snapdragon 615, but that's little comfort to our American readers since it's not currently slated to ship in the States. 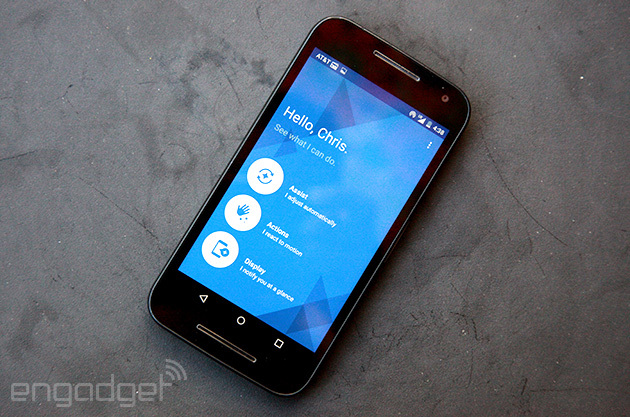 This is the first year you'll be able to customize the Moto G through Moto Maker to make it more definitively yours. The review unit I received at the company's press event last week was white with a navy blue backplate, but that seemed a little too boring for a week of full-on, real-world testing. Thankfully, our own Terrence O'Brien got a delightful black-and-purple model with a metallic pink accent running around the 13-megapixel camera. We swapped almost immediately. 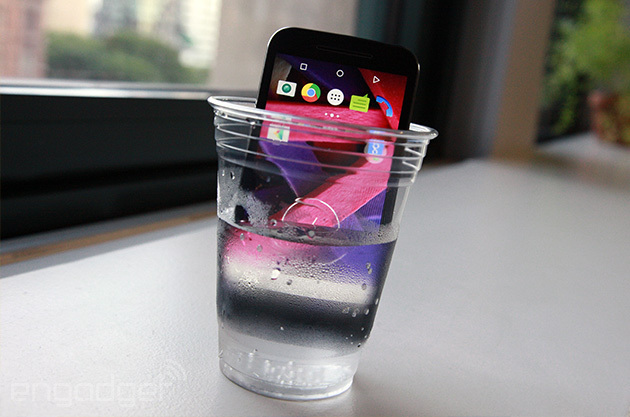 Regardless of the parts and configuration you choose, the new Moto G's body is waterproof for up to 30 minutes as long as it's in less than a meter of water -- a rarity for a phone at this price point. I didn't have a body of water to submerge myself and the phone in during my week of testing, so I settled for taking showers with it and dunking the thing in my drinks (still a crowd-pleaser!). Surprise, surprise: It still worked like a charm. Oh, and perhaps the most important addition to the mix: LTE support! For the longest time, Motorola's best-selling phone only came with HSPA+ radios, but the US version plays nice with LTE bands 2, 4, 5, 7 and 17, meaning it should work on just about any GSM carrier in the United States. Curiously, early spec sheets — including the ones given to us at the event — said the G supported LTE band 12, but that no longer seems to be the case. Sorry, T-Mobile customers, there goes any chance you had of using VoLTE calling on this thing. When it comes to crafting a low-cost phone, you have to cut corners somewhere. For Motorola, that "somewhere" often winds up being the screen -- that's why after nearly two years we're still looking at a 720p display on a brand-new smartphone. I'll be the first to admit my eyes might have been spoiled from testing so many Quad HD handsets as of late, but thankfully the LCD panel here is no slouch considering the price. On the whole, the Moto G's screen is a solid performer with a noticeably dry, blue cast; you might notice the display's color temperature sucking some of the life out of pure whites, but it's only really apparent if you've got a better-screened phone sitting nearby. Still, colors are bright and nicely saturated without appearing lurid, and they seem a touch more accurate than on last year's model. Speaking of the 2014 G, my old review unit had some issues with backlight bleeding, but Motorola seems to have tightened up its production process since then. 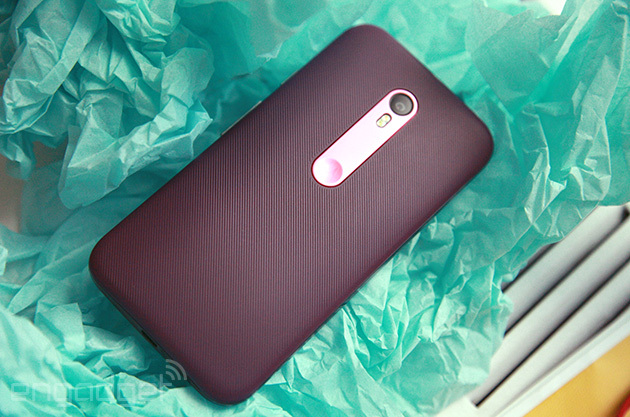 Don't be afraid to take the Moto G out of your cave, either. (We all have those, right?) This display is one of the brighter ones I've seen on a cheap smartphone, and it easily outshines the 2014 Moto G and even Huawei's P8 Lite when it's cranked up to the max. The G's viewing angles are none too shabby either, even if the backlight gives things a milky cast when you hold the phone just right. Coincidentally, my biggest quibble had to do with turning the screen to view it at an angle; the plain white of the app launcher or a web page can look gritty when viewed askew, probably due to how the panel's subpixels were laid out. It's really not a big deal and it shouldn't keep anyone but the biggest screen snobs from shelling out the cash for this thing, but it's one of those things you'll never be able to un-see. Oh, and the single front-facing speaker on the G's face isn't too bad either. It struggled to give deep, bassy tunes their needed oomph, but mids and highs came through with vigor, although the resulting sound could be a little muddy. One of these days, Motorola will find a way to squeeze a quality set of drivers into its mass-market movers, but until then we're left with something that's loud and doesn't sound terrible. That'll be good enough for most. What's there to say, really? 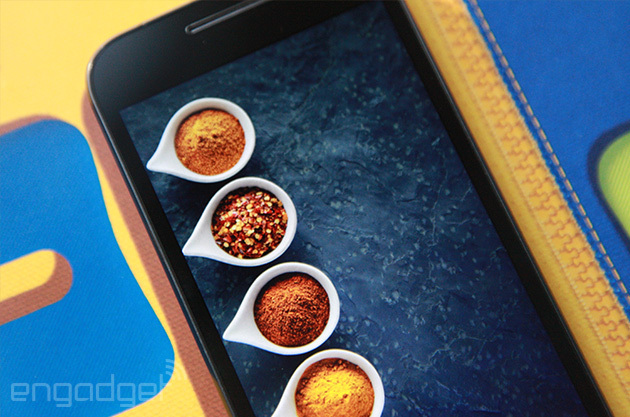 Unlike other low-cost smartphones, the Moto G proudly packs what the company calls a "pure" Android experience. Before we go any further, though, we've got to make a distinction between stock Android and what Motorola's got going on here. What you'll see is almost all vanilla Android 5.1.1, from the behavior of the Google Now tray to the oh-so-light app launcher windows to those nuanced volume controls. Most of the major changes here are unseen, in that they help Android work a little more intelligently with the underlying hardware. And the rest of Motorola's tweaks? Well, there aren't many. 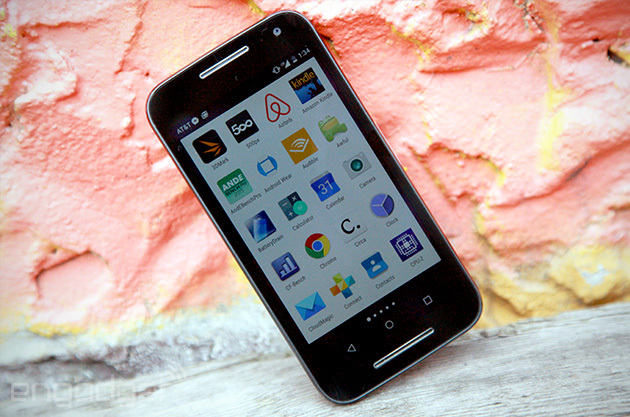 When you fire up the G for the first time, you'll probably notice the dearth of non-stock Google apps; there are only three this time around, and that's down from the number of add-ons that Motorola included in the 2014 edition. That doesn't mean the additions here aren't useful, though. First up, the basics. The phone is always on the lookout for telltale gestures (still no way to customize them, alas) that fire up bits of hardware. Longtime Moto fans will know to crank their wrists twice to launch the camera -- which sounds a little more awkward than it actually is -- but now you can karate chop air while holding the phone to turn on the flashlight. The accelerometers watching for these motions can be a bit finicky and prefer sharp, crisp gestures, so don't be surprised if it takes a few moments of looking like a putz before the phone launches what you want it to. Meanwhile, most of Motorola's contextual smarts can be controlled from the generically named Moto app... but you won't need to spend much time there outside of some initial setup. Take Moto Assist, for instance: You can program your usual sleep schedule so the phone knows when to quiet down. Also, allowing Assist access to your calendar will keep the phone quiet when you're napping through your meetings and other events on your docket. If you'd rather not give Motorola such broad access to your goings-on, you could also just give it a specified location where the phone should go silent (think: your home, places of worship and so on). I've never thought the ol' "furiously mash the volume buttons to shut the phone up" routine was all that annoying in the first place, but setting up a few basic Assist rules could easily help some people save face. As I mentioned before, Motorola finally fitted the G with Moto Display, a neat bit of software trickery that lights up the screen with icons when a new notification rolls in or you nudge the phone. Alas, it doesn't work quite the same as it did on the Moto X because of some crucial hardware differences: No infrared sensors means no Jedi-mind-trick-style hand waves to activate the screen, and Motorola's choice of an LCD screen instead of an AMOLED one means the whole panel lights up instead of just the area where icons live. The feature doesn't seem to have taken a toll on the G's battery life (more on that later), and it always showed me what I wanted to see with just a quick nudge. Still, I suspect a few of you will gnash your teeth over that lost notification light. I feel your pain; I really do. Motorola was surprisingly blunt about what it did here: It basically plucked the same 13-megapixel sensor from the enormous Nexus 6, kept the f/2.0 aperture lens and added some additional IR-filtering coatings. The result is a camera experience that's leagues ahead of last year's model. Colors are bright and natural-looking, especially with ample light, and my test shots are crisp and detailed. 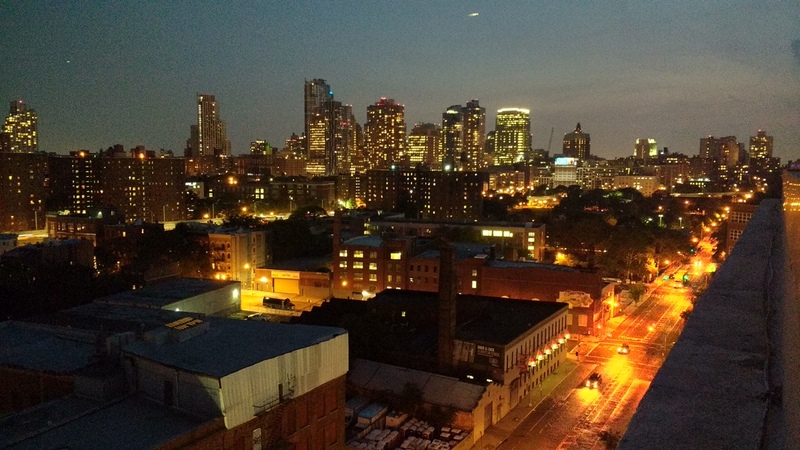 Of course, that hardware transplant also means the Moto G inherited the Nexus 6's low-light weaknesses. This is a mostly forgivable sin for a phone that only costs $180. If anything, it's tragic that Motorola stuck such a wimpy low-light performer in its very first attempt at a Nexus device, but I digress. Flipping the camera into video mode reveals that the 1080p video quality is fairly mediocre; there's not a lot of detail to be seen and colors appear bland even in generous lighting. The 5-megapixel camera up front doesn't aspire to much, and churns out adequate, if unexciting, shots. Motorola endowed it with a slightly wider-angle lens this year, though, so at least you can squeeze a few more friends into your poorly thought-out selfies. The actual process of shooting a photo is as straightforward as it's always been, which basically means there's zero delay between launching the camera app and snapping away. In case you haven't experienced Moto's approach before, there's barely anything on screen when you're taking a photo: One touch on the display captures an image, and holding your finger down takes a series of them. This dead-simple system works nicely until you actually decide you need some control over things, at which point a quick swipe left from the screen's edge brings up your options. Just don't expect a full manual mode. The best you can do is fire up HDR, or toggle the super-useful exposure and focus controls. Your shooting won't be lightning-fast after that, but you can home in on exactly what you want to see and make sure it's reasonably well-lit. It's so handy, in fact, that I just leave it on all the time now (and you probably should too). Motorola's shooting philosophy might not be the most powerful or the most nuanced, but it's fast and offers just enough control to keep frustration at bay. Keep it up, Moto. Right, so here's where things start to get tricky. You see, this year's Moto G uses one of Qualcomm's quad-core Snapdragon 410 chips, with the CPU cores clocked at 1.4GHz and an Adreno 306 GPU. That doesn't seem like a huge lift in horsepower compared to the 2014 edition (quick refresher: a 1.2GHz Snapdragon 400 and an Adreno 305 GPU). That said, spending an extra $40 now gets you the G with 2GB of RAM -- double the amount of memory you'd have gotten last year. The reason I'm harping on seemingly modest changes is that it's easy to assume falling silicon prices and shifting demand mean yesterday's flagships are today's cut-rate volume sellers. Not always. We're still working with a phone on a budget here, but it moves with a level of polish and fluidity that might make you forget how much you actually paid for it. Of course, our usual suite of benchmarks reminds you what you're paying for. A bunch of numbers in a table don't always tell the full story, though, and I've found very few situations where the Moto G struggled to get things done. In fact, I couldn't tell you the last time I encountered a hiccup during my daily grind (think: Gmail, Hangouts and Slack; watching TV episodes on YouTube; and playing the odd game). After a while, I'd have what felt like countless apps going in the background, but the decision to offer 2GB of RAM meant switching between them always felt fluid. Turns out the Moto G has some gaming chops after all, especially when playing Dead Trigger 2; graphical quality is cranked down to low by default, at which point everything ran smoothly. To my surprise, though, turning up the dial on those visuals to maximum still left me with adequate gameplay; there was quite a bit of stuttering while cutscenes depicted the collapse of society as we knew it, but that was about it. The very same could be said for my time playing Asphalt 8 with the settings maxed out -- just know that the screen is more likely to get warmer than the rest of the G's body. Now, how about that battery? It's a little sad that it took Motorola this long to increase the capacity of the G's battery, but whatever: This year we've got a comparatively spacious 2,470mAh battery to work with. In our standard rundown test (video looping with screen brightness set to 50 and WiFi on), the G managed to last 10 hours and 40 minutes. That's on par with, or better than what I squeezed out of, some flagships. The second-gen Moto X, for instance, managed a few minutes less, and the HTC One M9 came up nearly two hours short when I tested it earlier this year. That's a big, big increase over the second-gen Moto G too; that device only managed seven hours and 38 minutes. You've already got a sense of what my days sort of look like (recap: I eagerly replace human interaction with mashing on a phone), and indeed, the G survived through that near-constant use for over 14 hours before needing a recharge. If your daily workload is lighter than mine, you'll find the G is capable of lasting even longer -- I'd often get a day and a half of use if I saved most of my communication for my computer instead. If you hadn't already heard, companies are starting to take this cheap, good, unlocked phone business seriously. The Moto G isn't the only inexpensive contender on the block, and that means very, very good things for your wallet. First up is the obvious option: the ultra-cheap Moto E. This updated model isn't too far off from the G in terms of its spec sheet and price, but it isn't nearly as fluid or responsive as its slightly more expensive cousin. 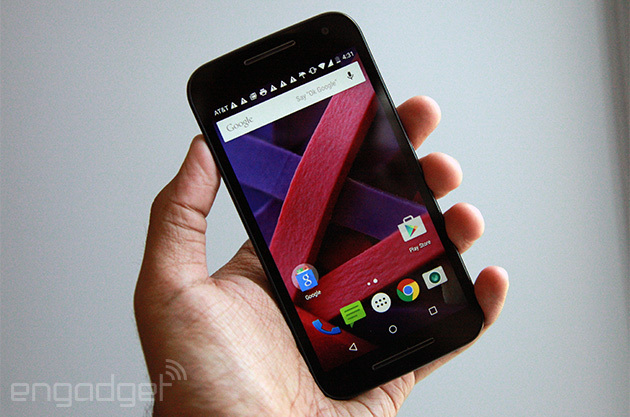 Pay the extra $30 (compared to the 4G Moto E) for the Moto G if you can. It's worth it. ASUS' ZenFone 2, on the other hand, packs a 5.5-inch, 1080p screen into a curved body that feels surprisingly dainty in the hand. The base model costs $199 and is powered by a 1.8GHz quad-core Intel chipset. Throw in niceties like dual SIM slots and a microSD slot that takes up to 128GB cards and you've got a potential winner... unless you like fast updates and the look of stock Android. 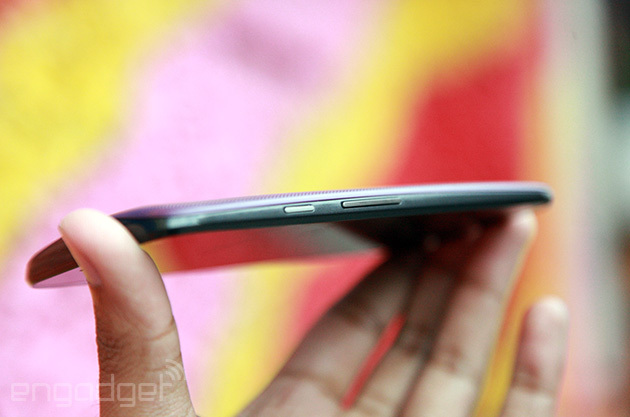 The ZenFone 2 is skinned to within an inch of its life, and the overall effect was just too much for me to deal with. Then there's Huawei's $250 P8 Lite, which also comes with a 5-inch, 720p display. It's more a competitor to the 2GB version of the Moto G, but -- as you've seen in our benchmarks -- the octa-core Snapdragon 615 gives the P8 Lite an edge in pure power. This low-cost competitor only runs Android 4.4.4 KitKat, but it almost doesn't matter because Huawei painted over it so completely with its own Emotion UI. Personally, I love stock Android, so I wouldn't go in for one of these over a Moto G, but those of you looking to try something different might want to keep it in mind. Alcatel's OneTouch Idol 3 might be the most palatable of the bunch; it's certainly the sleekest looking. It too will set you back just $250, and has a Snapdragon 615 chip with 2GB of RAM. It's a little heartening to see Alcatel kit this thing out with a properly good 5.5-inch, 1080p display, not to mention stereo front-facing speakers. Oh, and the pièce de résistance? The phone'll work fine no matter which way you pick it up. Ultimately, this is the sort of phone I wish Motorola could've made and sold for $179, but alas -- the laws of gadget economics are cruel indeed. 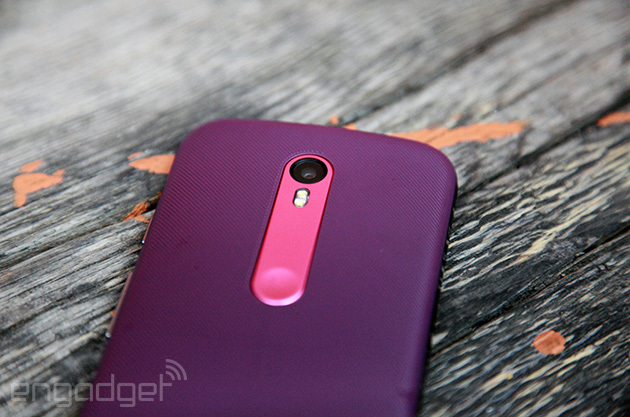 Last year, I wrote that the then-new Moto G was "still the best budget smartphone" around. Little did I know that the quality bar for cheap phones would shoot into the air the way it did over the past 12 months. This updated Moto G faces fiercer competition than it ever has before, and it may well lose its hard-fought, low-cost crown someday. Today is not that day. Even with outstanding devices like Alcatel's Idol 3 being sold straight to consumers, the Moto G still stands tall as the cheapest Android phone you can buy without feeling like you're missing out on something. Make no mistake: Motorola had to make plenty of compromises to be able to sell this thing as cheaply as it is. Motorola's real gift is in making the G feel more powerful, more elegant than it really is, and that's worth the asking price.